Who Needs the Mid-Credits Scene in 'Thor: The Dark World' Explained? If you were a bit confused about what happened in the mid-credits scene in this weekend's inevitable box office champion Thor: The Dark World (there's also an amusing scene at the end of the credits), you're not the only one. There are plenty of non-comic book readers out there who didn't know what the odd scene in the middle of the credits was all about. We'll explain the scene below (so beware of spoilers), and talk about how it will affect the rest of Phase Two in Marvel's cinematic universe, and how it even hints at what might be coming up in Phase Three. So without further adieu, let's dive into some nerdy comic book stuff. After some of the credits have rolled for Thor: The Dark World, we're reunited with Sif (Jaimie Alexander) and Volstagg (Ray Stevenson), who are taking the dangerous Aether for safe-keeping at what looks to be a strange alien museum/indoor zoo run by someone who looks like Will Ferrell as Mugatu in Zoolander. Well, that guy is actually Benicio del Toro as Taneleer Tivan, or as he's more commonly referred to and called in the scene, The Collector. He's one of the Elders of the Universe (coming in at about three billion years old), a group of alien beings who are the last remaining members of their respective species. Each of the Elders had their own obsessive hobbies, and as you might have guessed, The Collector likes to collect things. Artifacts, alien creatures, weapons, etc. are his obsession, and in the comic books, he ends up wanting to collect The Avengers. And so, Sif and Volstagg have been tasked with handing over the Aether to The Collector for safe-keeping (though you can tell this guy isn't very trustworthy), because Asgard is already storing the Tesseract (from Captain America: The First Avenger and The Avengers), and as Volstagg explains, it's too dangerous to keep two Infinity Stones in the same place. When this was said, some people might have gasped, fainted or screamed with excitement. And the moment was made all the better when The Collector ominously said, "One down, five to go." If you don't know why all this is so thrilling for Marvel fans, we'll explain that too. Power Gem (Red) – Increased strength and durability, enhances superhuman ability, energy manipulation. Time Gem (Orange) – Time travel, stopping/slowing down or speeding up time, accelerate or slow down aging, see into past/future. Space Gem (Purple) – Travel through space, mostly through teleportation. Able to interfere with the motion of other objects. Soul Gem (Green) – Observe, attack or even steal a being's soul or spirit. Also used to revert individuals to their natural state. Reality Gem (Yellow) – Alters all of reality; similar to the effects of a Cosmic Cube, but much, much higher. Mind Gem (Blue) – Near-limitless psionic/psychic abilities including empathy, telepathy and telekinesis. In the film world, we've had the Tesseract and the Aether, clearly red and blue, but they don't exactly correspond with the gems from the comic books. The Aether could be considered the Power Gem seeing the effects it had on Jane Foster and Malekith in the film, but it doesn't fit perfectly. As for the Tesseract, it doesn't really fit the description of the blue Mind Gem, or any of the gems for that matter, so we're not sure how that will change things as the story unfolds. Anyway, why are all these gems important? Well, in the comic books, they are all collected by Thanos, who appeared in the credits scene in The Avengers, and fitted into a golden glove, creating a weapon known as The Infinity Gauntlet, which is part of one of the most iconic Marvel storylines. He ends up using it to destroy half the universe in order to please the physical embodiment of Death (now you know why that line in the credits bumper about courting death is important). 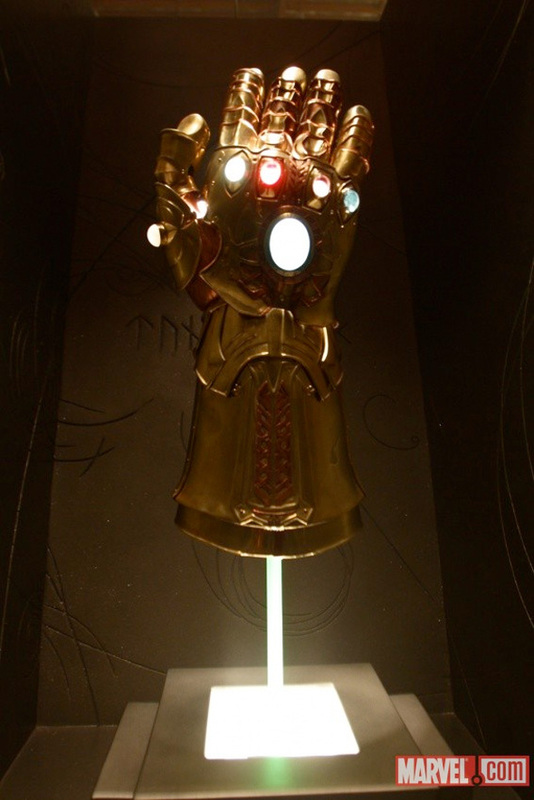 As you can see in the photo above, The Infinity Gauntlet was once on display at Comic-Con in 2010, but only briefly. Of course, with the Internet spreading things like wildfire, everyone found out about it, and talk of a lead-up to the famous comic storyline coming to life on the big screen has been rampant. And now with this mid-credits scene in Thor: The Dark World, it's pretty much confirmed. But how will this all play out? Well, the mid-credits scene is certainly part of a bigger plan for what lies ahead in the Marvel universe, but it's also a big set-up for Guardians of the Galaxy. We learned Benicio del Toro was playing The Collector over the summer, and this leads into that cosmic superhero ensemble rather nicely. The character has been said to be one of the villains in the film, but director James Gunn (who directed the scene in question) said Ronan the Accuser (Lee Pace) is the main villain, and he works for Thanos. More than likely, The Collector merely wants the gems for his collection, but in the comics, the one gem he gets ahold of ends up being taken by Thanos. We're guessing Guardians of the Galaxy will involve another Infinity Stone, and our ragtag team of heroes has to stop it from falling into the wrong hands. As for Thanos, we're betting this will lead-up to his appearance as the main bad guy in The Avengers 3. Some originally thought he would take the spotlight in The Avengers 2, but when the title was announced as The Avengers: Age of Ultron (with James Spader playing the title villain), that pretty much put the kibosh on that plan. However, there's likely still some kind of connection to the bigger Marvel plan there. Of course, we're still a couple years away from finding that out. No matter what happens, it's incredible to see this kind of cohesive planning between multiple blockbuster franchises. Having Marvel bring some of their most iconic storylines and characters to life in this manner is unprecedented, and the studio continues to give fans what they want, even if they mess with the mythology a bit (see Mandarin in Iron Man 3). All I know is the feeling that arose when the Infinity Stones were mentioned in this credits scene made me feel like a kid again. We can't wait to see what happens next. Great explanation. Can't wait to see what unfolds over the next few years! Good article. Explains a lot. One note:Please hire some interns to edit your writing. And don't say you didn't have time. I agree. Aren't you a senior editor Ethan? the tesseract is space not sure about the aether but if i had to guess it is reality. Beautiful explanation you gave here. I want to hug this cinematic universe to my chest. Wikipedia is your friend, folks. Meh...http://www.craveonline.com/film/interviews/601057 this interview that Crave Australia did with Kevin Feige that went up a few days ago actually explains that they ARE Infinity Gems - the Tesseract is Space and the crystallised Aether is another Gem - though which is unspecified in the article..
You're assuming they follow the cannon almost to the letter. Well, in the scene the Tesseract is definitely an Infinity Stone because it's specifically called that. It's just a matter of what stone, and the way the stones transfer to the big screen may not be exactly the same as it is in the comic books. Hmmmm you know what i havent had in awhile.....................Big League Chew. Can someone explain to me (and why no one has mentioned) the cheap and tacky production level of this scene? It looks like it was shot in Kevin Smith's basement! It felt like a scene from an early Power Rangers episode - not from a multimillion dollar plus franchise. Seriously not bagging on anyone here - just was truly shocked with how cheap it felt........anyone else agree?